And to piggyback, since I haven't been on here much, as I'm trying to just go in as blank as possible for Philly... can someone post a pic of the Red Zone (or point me towards one), sort of showing how large of an area it is, etc. I have never been in Red Zone. I have RZ for NJ. 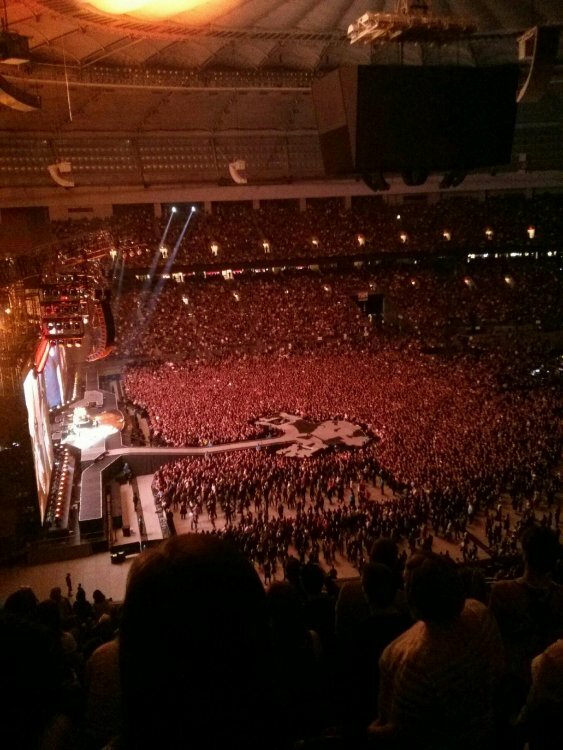 Judging from the pics of the first to shows, RZ is far to the left of where the band plays on the main stage. The ramp is not centered as I thought it would be. I am going to shoot for the B stage. I believe that is the best shot to get up close for at least 6 or 7 tunes. someone posted this in another thread. assuming all of the shows will be like this. Been to 4 RZ's now and there really isn't a bad place to stand. Cool, that's all I needed to see... will just disappear again until after I see the boys in Philly from RZ. Thanks! At the b stage, can anyone tell us who's been, who is usually at the nearest 'branch' to RZ? Is there a chance that we'll be looking at the bands' backs for those songs? How could you have been to four RZ's now? There's only been 3 shows so far--? Also, when you say there's not a bad place to stand, what about the RZ being so far off to the left of the main stage? Hmm. 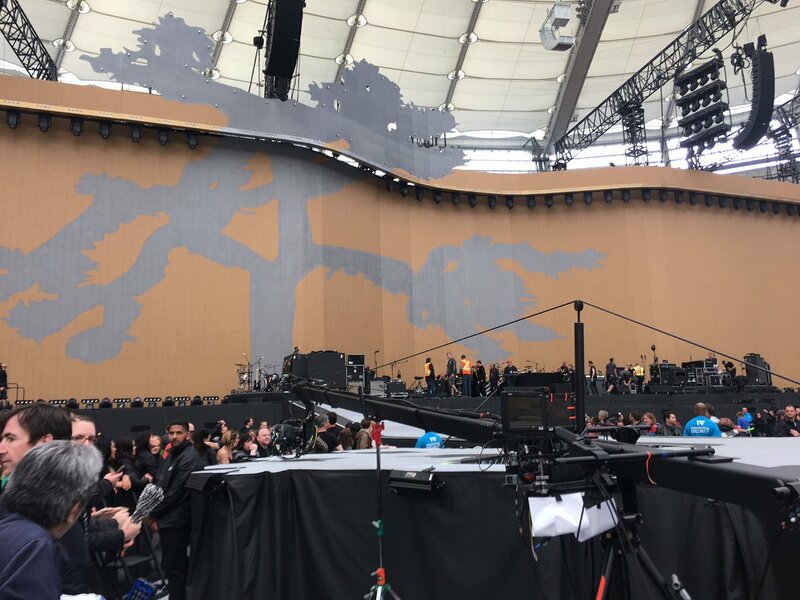 Following up on the reply I just posted, I've seen some posts saying that when U2 is on the main stage that they're entirely (even Edge) to the right of the ramp--is this correct? If so, that seems to suggest that the RZ (particularly the closer to the main stage one is) is quite a bit to the left of the entire band--?? If so, I'd think that one probably wants to be closer to the B-stage, which would also give a better (more straight-on) view of the main stage--?? We went to the San Jose show. Great view back towards the end of B stage. It was epic!! The pictures we took our friends thought were off the screen behind the stage, they couldn't believe how close we were. The best part was we were able to move about freely and still have a good view, but once they moved to the main stage the view changed so we enjoyed the beautiful visuals and graphics. The best time, ever!!! Adding one of the pics from the show we went to. They've had RZ at other tours too. During 360, I went to 6 shows, 4 of which were RZ. Looking at the pics that have come out thus far, I don't see RZ being "so far off to the left". If you're in the red zone, and prefer to stay towards the front of the main stage, is it even possible to see over the ramp? OK, sure--but prior (e.g., 360) RZ experiences aren't relevant now (I went to a bunch of those too), because the new JT RZ is very different (i.e., only on one side--and it does look at least 2/3 of the way to the left of center stage). In fact, the "large view" pic above seems to suggest that that's the best-case RZ scenario--the ramp itself (which forms the center-most boundary of the RZ) seems about 2/3 of the way to the left. Along the same lines, other postings I've seen have said, for example, that the whole band (when they're on the main stage) is to the right of the walkway. If that's really the case, then being in the RZ close to the main stage would produce a pronounced side view (not good). And seriously, take another look at the "large view" pic above in this thread. It's pretty clear that when they're on the main stage, they are basically entirely to the right of the walkway--with the sightline disadvantage to RZ folks I'm concerned about. From the pic, it looks like the best way to deal with this would be to be up around the b-stage (which would also give a good view of them when they're there, of course). Can you say more?? What do you mean by "the view changed"? Could you see them on the main stage at all if you were close to the main stage? 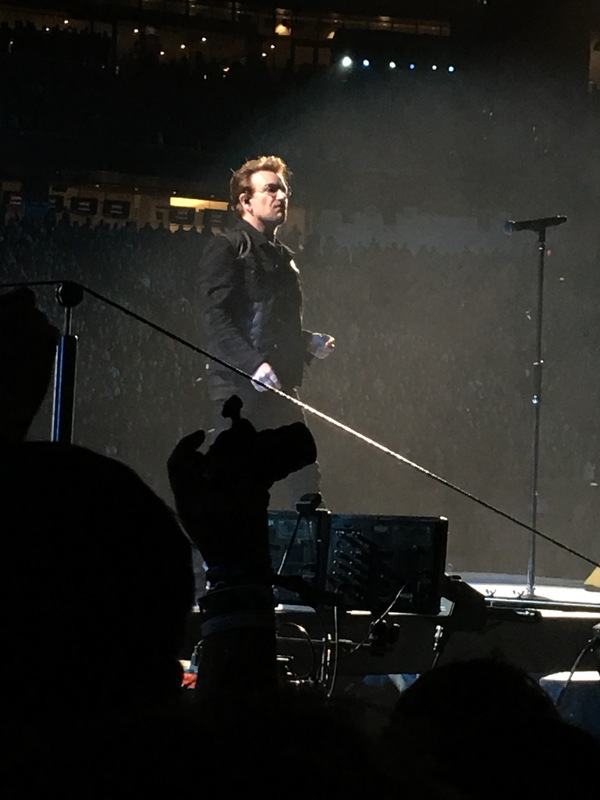 OK, found some "straight-on" pics of the stage. It's at least as bad as I thought--RZ is indeed very much off to the left (at least 2/3, maybe 3/4). Ouch. mike7man. I agree with everything you are saying. Its way to the left. I am going to shoot for the B stage. Best possible chance to get close. We were close to the rail towards the end of the B stage. You're right, the B stage is off to one side of the main stage - because of that we focused on getting the best view of the band within the area provided. To be honest, I could see the band on the main stage but the view was much better watching it on the backdrop, and the graphics were "amazing". Only speaking for myself here, but given the chance to be as close as we were was worth it. The odds of getting that close in regular GA are probably pretty slim and the main stage is really high so being up front doesn't give you a great view. 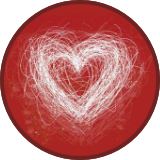 I hope you have a great time! It is an amazing show and you will have a great opportunity to be on the rail of B stage (try for the back, it's the best view of the band). Thanks for the info--appreciate it! Yeah--unfortunately, seems pretty clear that being close to the main stage is NOT the way to go. B-stage, definitely--that way, very close for the B-stage songs, and much better view when they're on the main stage. Agree with Sean. I was right next to him during the show and it was flat out amazing. All this talk about it being in a bad spot, too far left, etc is nonsense. I was in H-town R-Zone as well. The band was out on the tree for the first 3 songs and last couple encore songs. my advice is to be as far "up top" in RZ (even with the top of "tree"), at rail if possible and you will get a fine view for those handful of songs. Rail along walkway or facing main stage is a waste. The boom was a medium irritant. Also after the pre-JT songs, we moved back away from rail, PLENTY of room to really take in the main stage, music and extraordinary video graphics. Actually the view got better moving out away from the RZ rail - the band is up on the main stage and fully shifted over to the opposite side of where the tree trunk comes out of the main stage for 90% of the concert. Moving out and away allowed freedom to dance and nobody hold a damn iphone up in front of your line of sight filming half the concert for unknown reasons... Folks... there is going to be video and one way better than we can take. Sure everyone wants some pixs, put the camera screen on low, snap a few here and there then put the freak'n thing away and watch the magic with your eyes not thru a crappy two inch screen. Sing, dance, live. Don't record on and on. As has been mentioned, if you're aiming for the top of the tree the boom camera may obstruct your view on occasions.